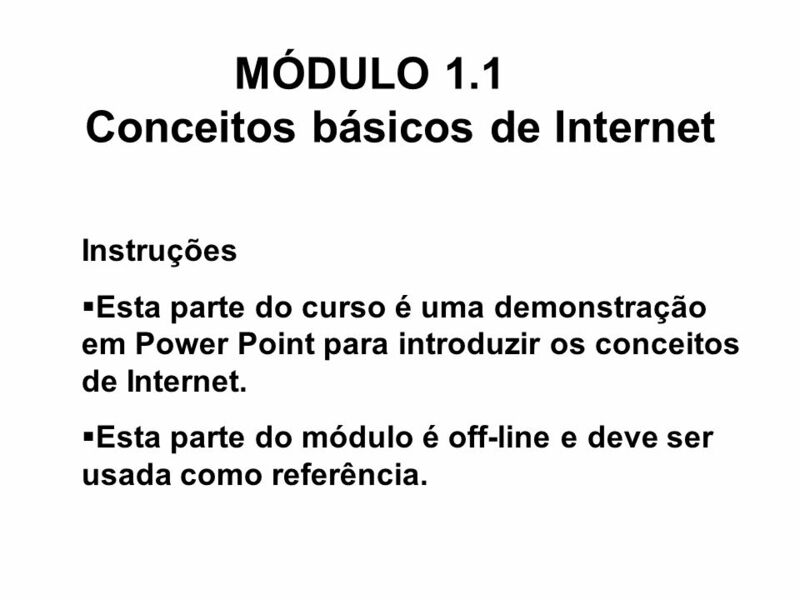 Instruções Esta parte do curso é uma demonstração em Power Point para introduzir os conceitos de Internet. 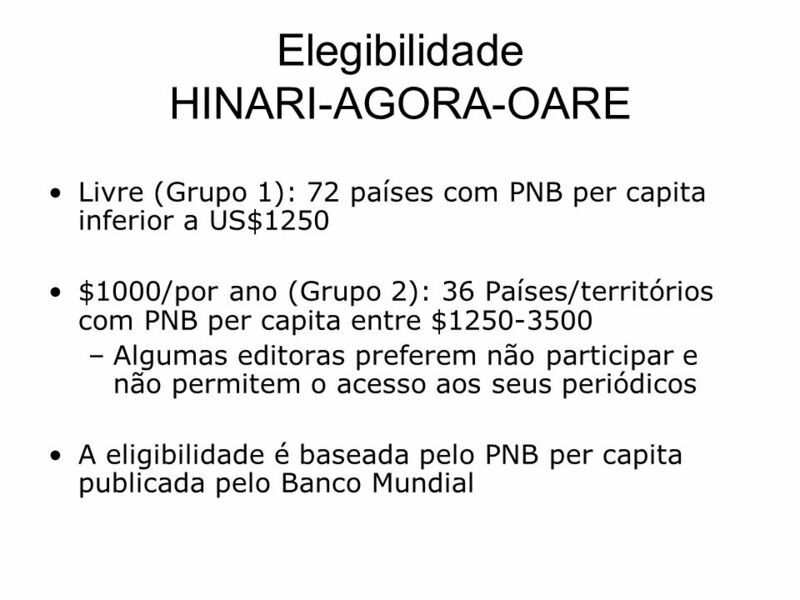 Esta parte do módulo é off-line e deve ser usada como referência. 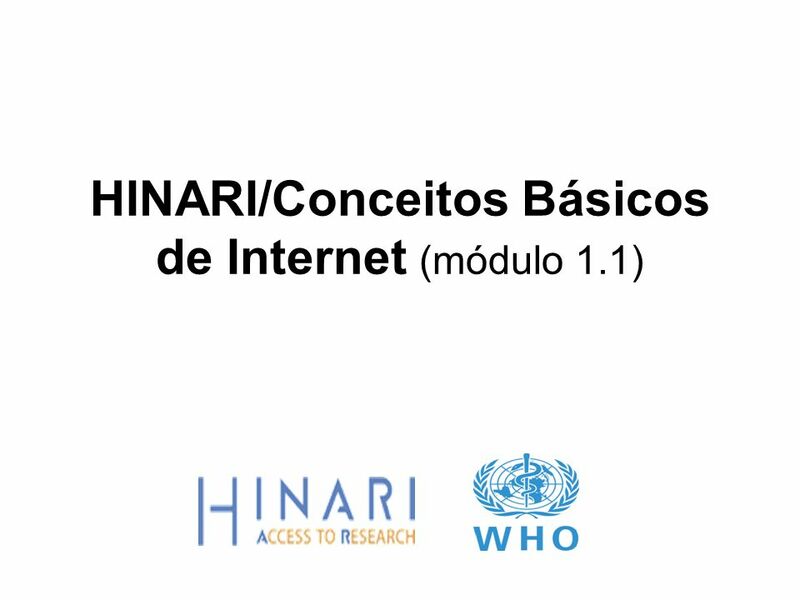 Estrutura da Internet Protocolos Internos Comuns Requisitos Técnicos para HINARI *Trainer Notes Introduce yourself and welcome everyone to course. Ask participants to introduce themselves and give some information on what they expect to gain from the workshop. Distribute the manuals and discuss briefly each item on the list. The topics to be covered in this review are: Basic definition of Internet terms and concepts that are routinely used in discussions on using the Internet. 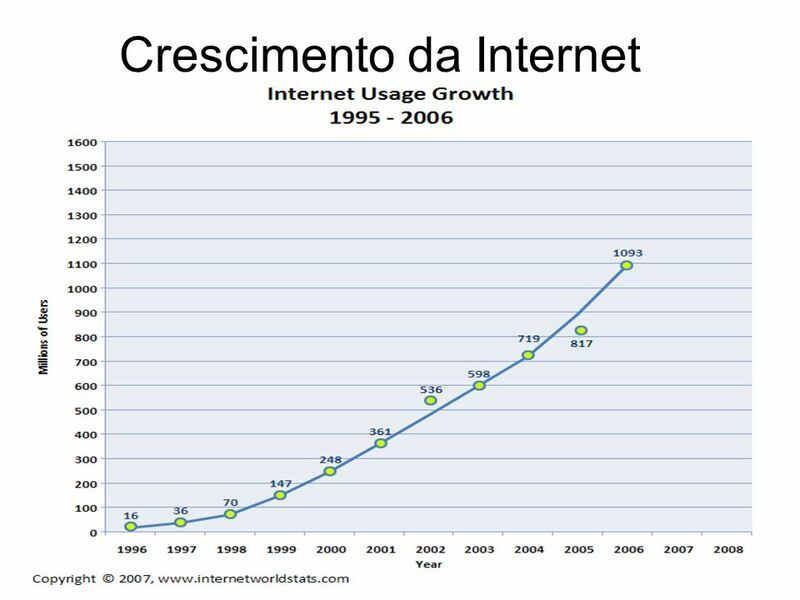 A brief history of the Internet will be provided. 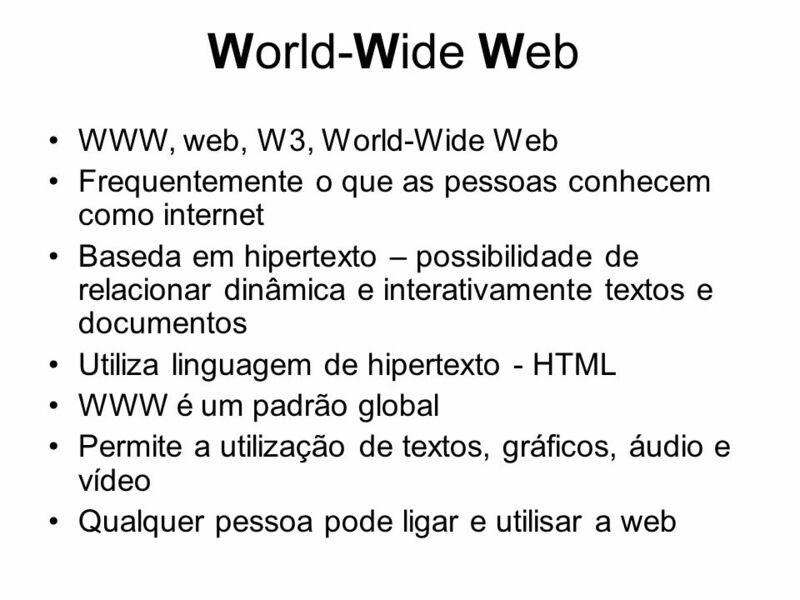 The structure of the Internet and the tools that drive the use of the resources will be covered including the World Wide Web and its components. 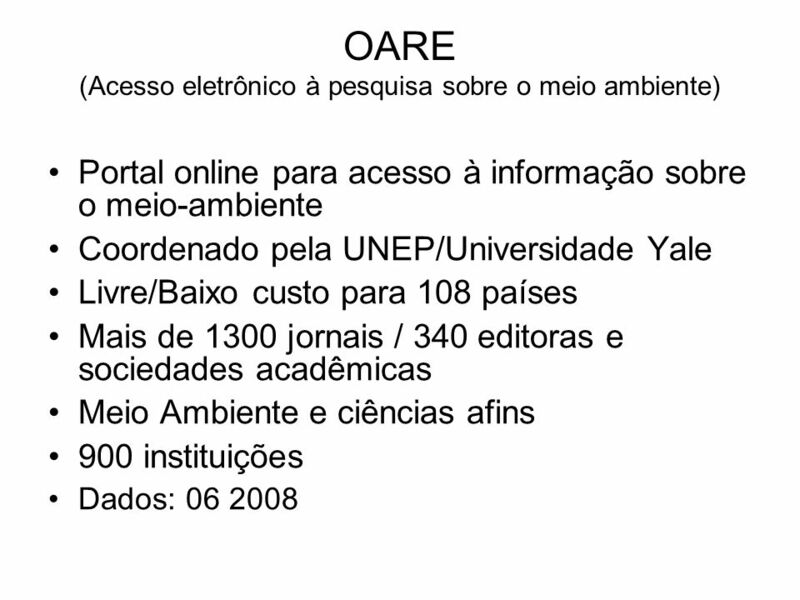 Types of Information resources and guidelines for their evaluation will be addressed. Search tools and techniques for accessing information will be covered. Researching Health and Biomedical Information on the WWW. 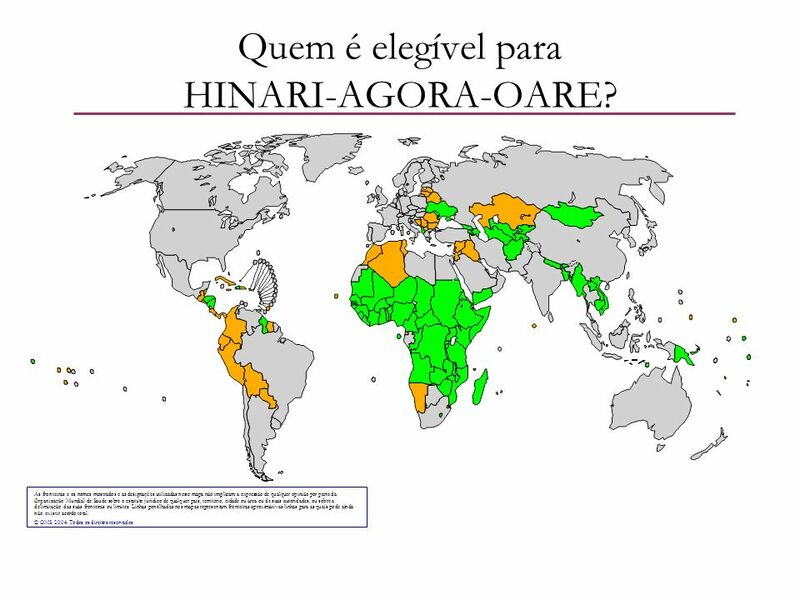 9 Quem é elegível para HINARI-AGORA-OARE? 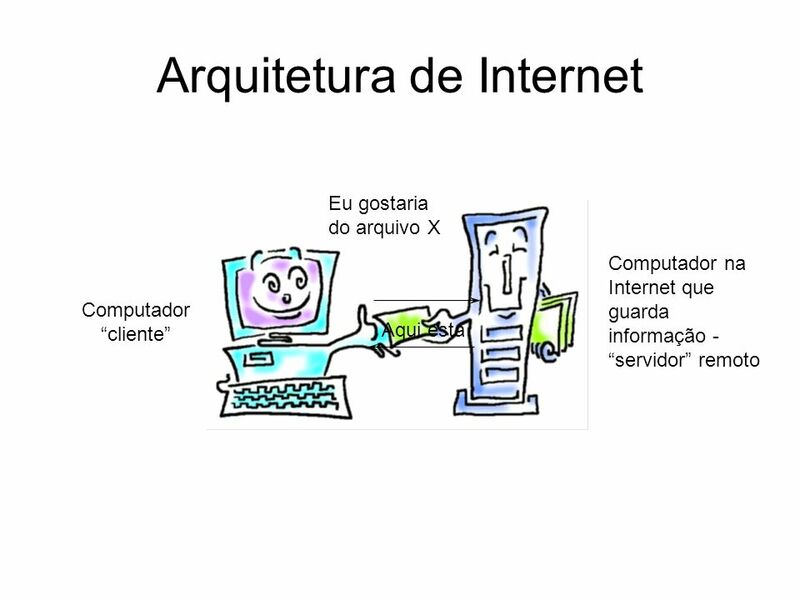 11 O que é Internet? 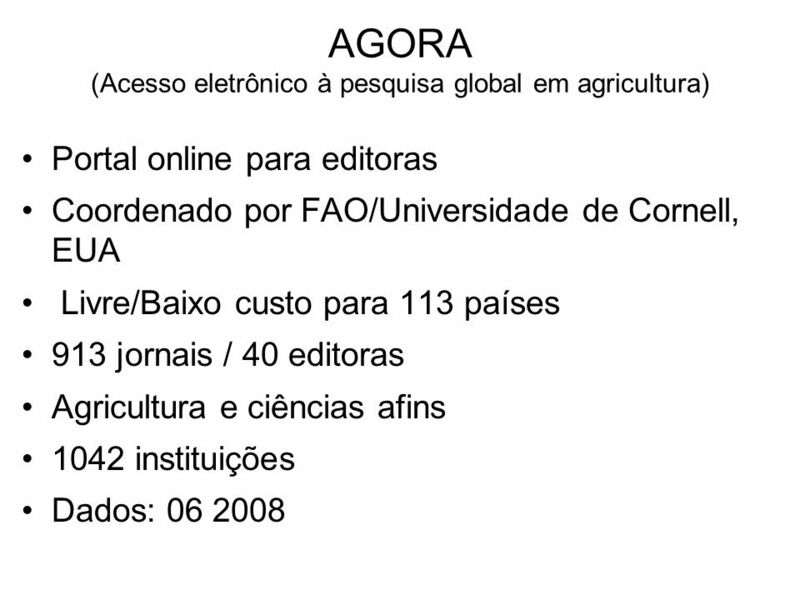 Rede de acesso público para computadores interligados, os quais se comunicam via programas de protocolo padrão. 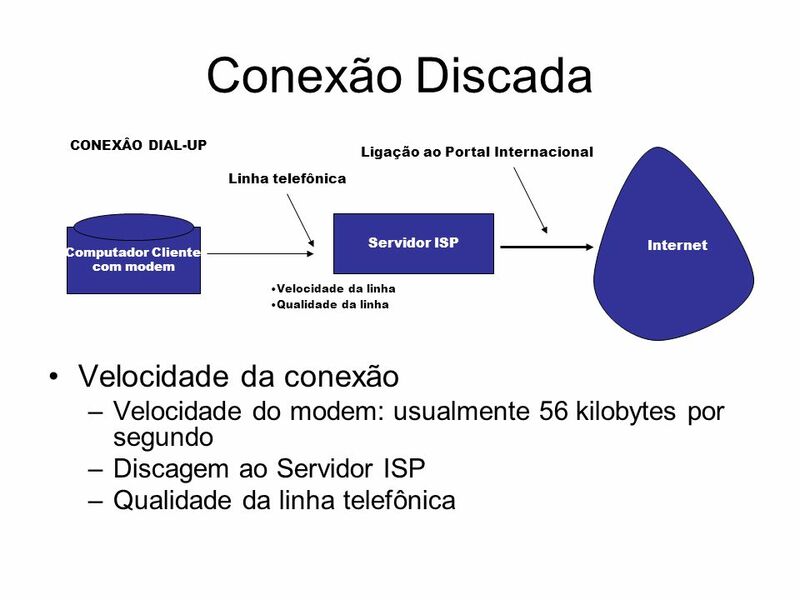 Acesso fácil (via modem e linha telefônica, ISDN, linha com cabos diretos, satélite) Expansão de infraestrutura global; é pan-nacional (sem controle central) A mudança mais significativa de disseminação da informação desde o surgimento da imprensa no século 15 Basic Internet Terminology What is the Internet? The Internet is a network of computers around the world that are linked together by telecommunications in order to share information. It is a network of networks. Different types of computers make up the network. Some computers contain information(host computers) or servers, others (clients) access the host or server to retrieve needed information. The Internet is a network of Computer Networks. Each computer on the network has a unique address, the Internet Protocol address (IP). It is made up of lots of servers and clients that hold and exchange information all over the world. The network is self organizing and self governing. There is no group that or individual that heads the network of net works. 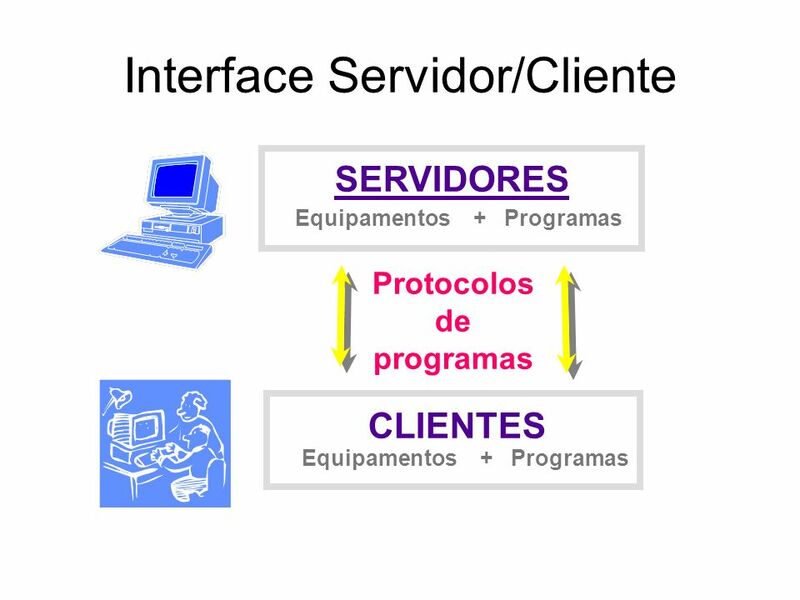 The computers are able to communicate with each other because they use a common set of rules or protocols The protocols Transmission Control Protocol/Internet Protocol (TCP/IP) allows the connection and exchange of information between computers. 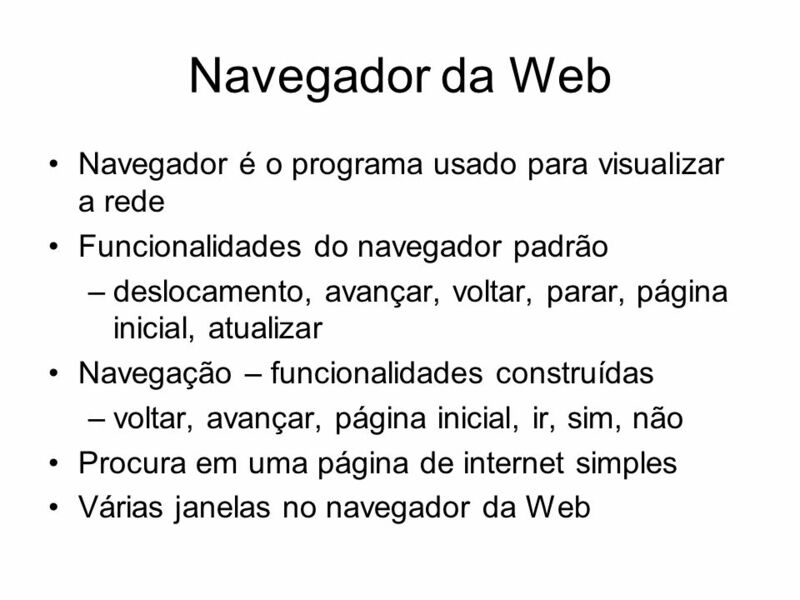 There are a number of Internet protocols that make communication and information retrieval possible on the WWW. Telecommunications: The computers are able to communicate and exchange information because they use a common set of rules or protocols. 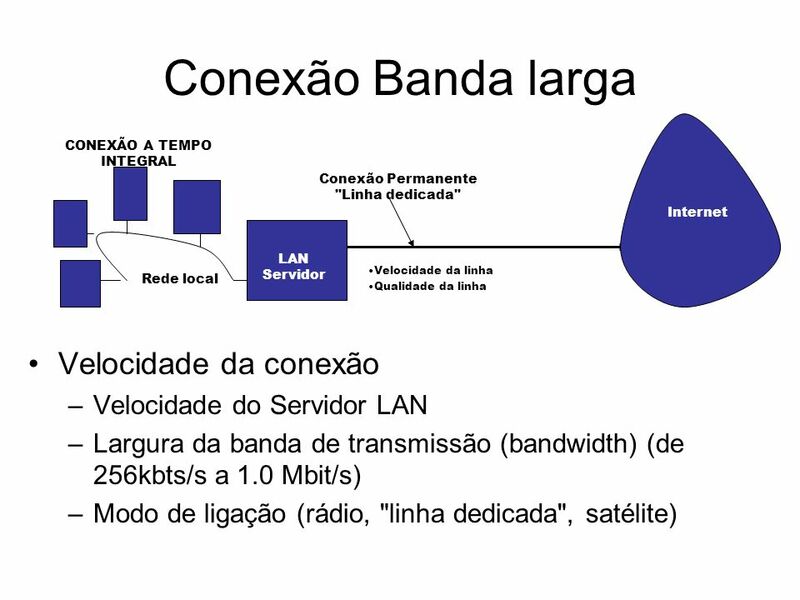 These protocols allow us to connect to a remote computer(server) and access the information on it and perform any number of activities. The computer Networks communicate with each other.They are able to communicate because they use a common set of rules known as Internet Protocols. 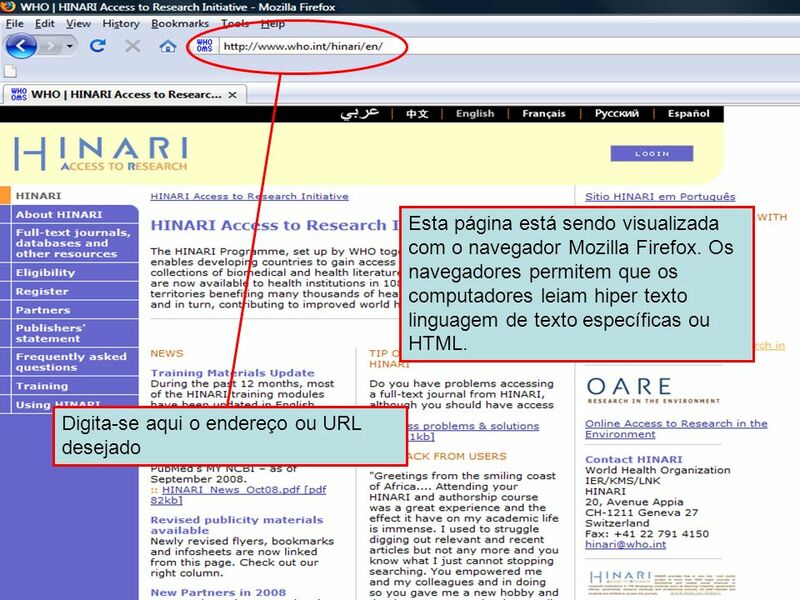 Pode ser visualizado usando o navegador Mozilla Firefox. 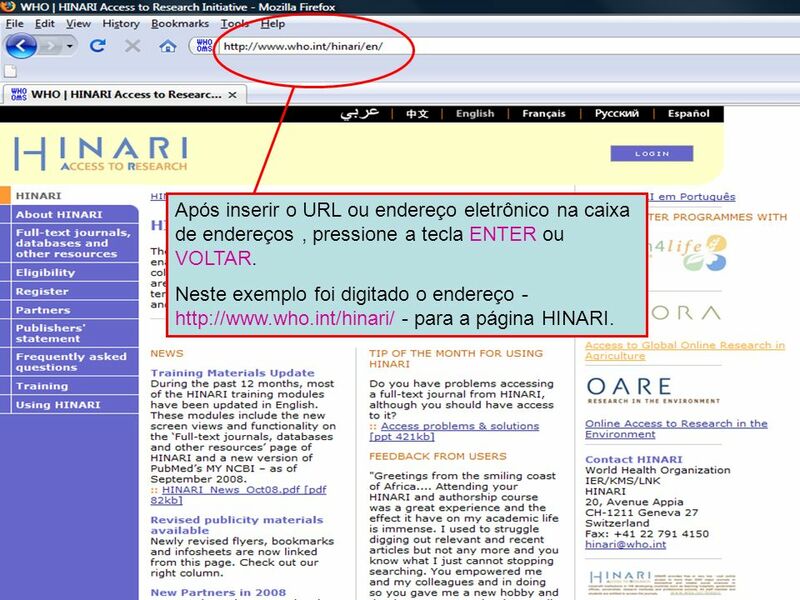 Após inserir o URL ou endereço eletrônico na caixa de endereços , pressione a tecla ENTER ou VOLTAR. 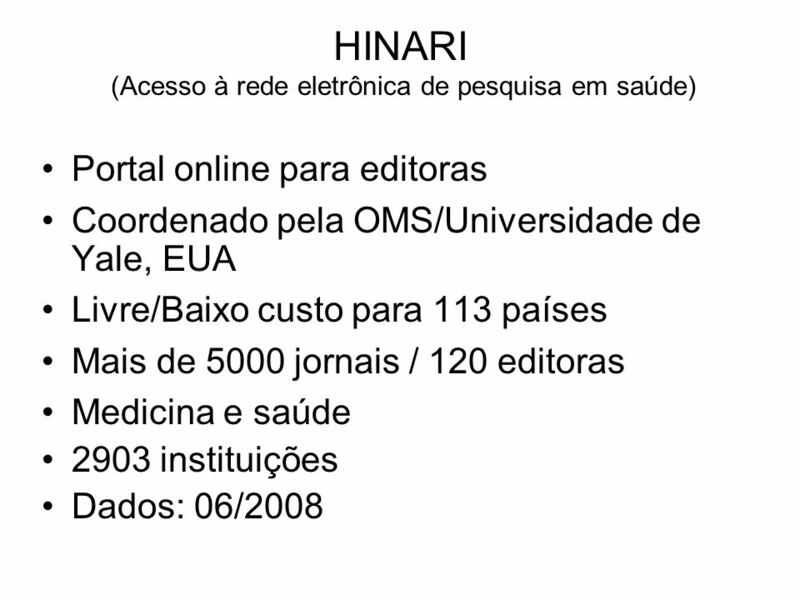 Neste exemplo foi digitado o endereço para a página HINARI. Enter the URL and either press the RETURN key or click on the “Go” button. 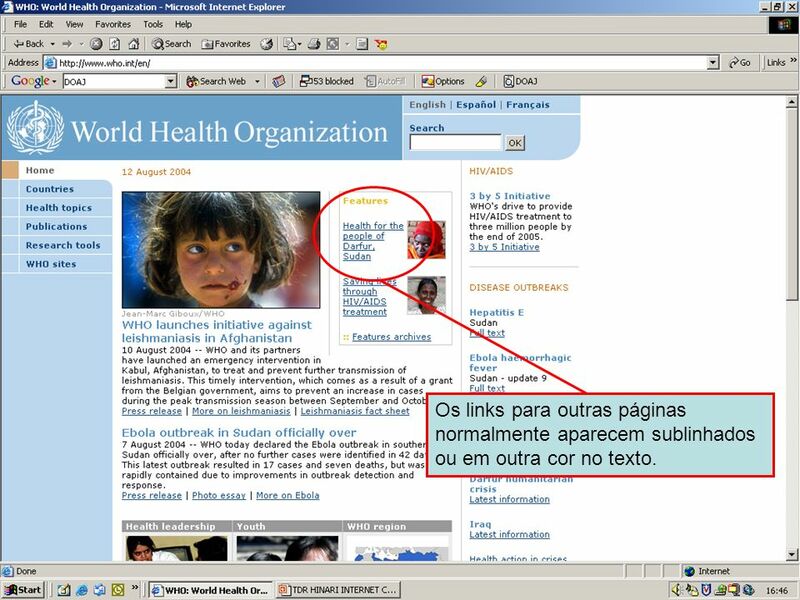 28 Hypertext links Hypertext links are usually denoted by underlined text. 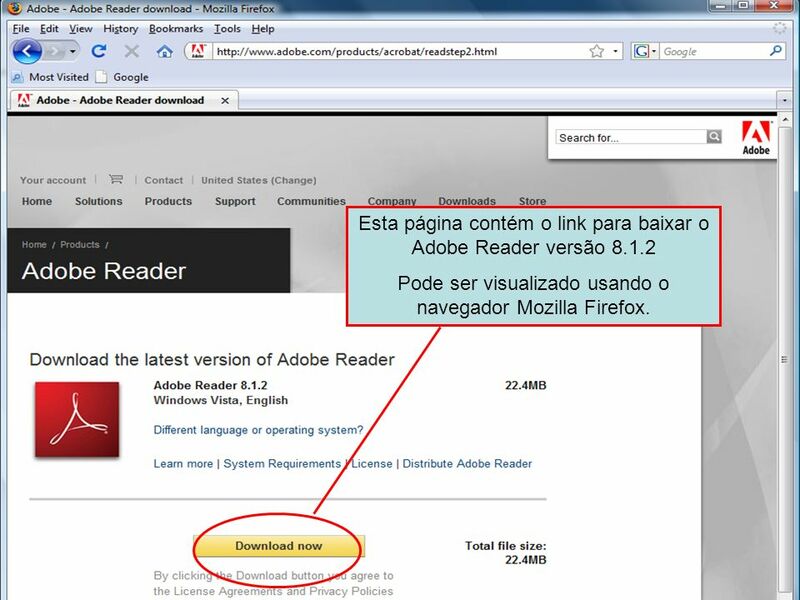 Os links para outras páginas normalmente aparecem sublinhados ou em outra cor no texto. 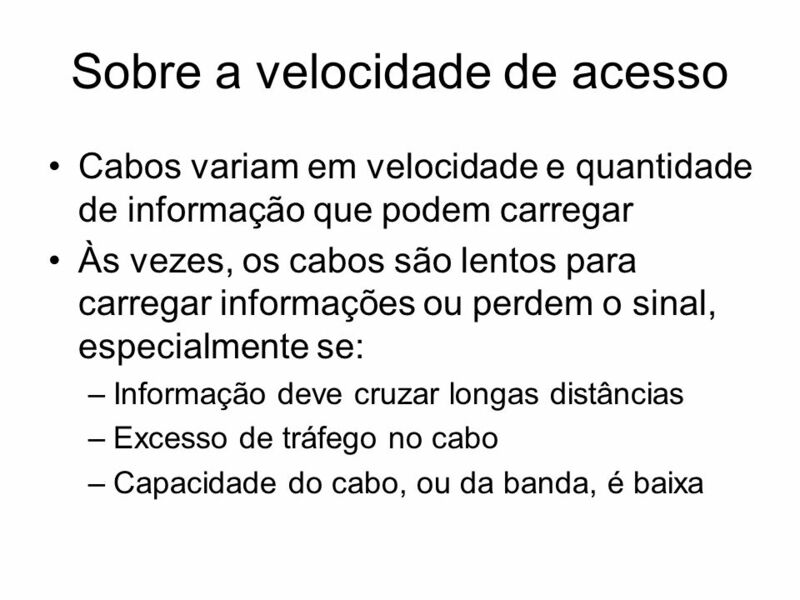 As setas na barra de ferramentas permitem aos usuários retornem ou avancem para as páginas já visitadas dentro desta ou de outra página eletrônica. The back and forward buttons allow you to navigate to previous pages within a website. 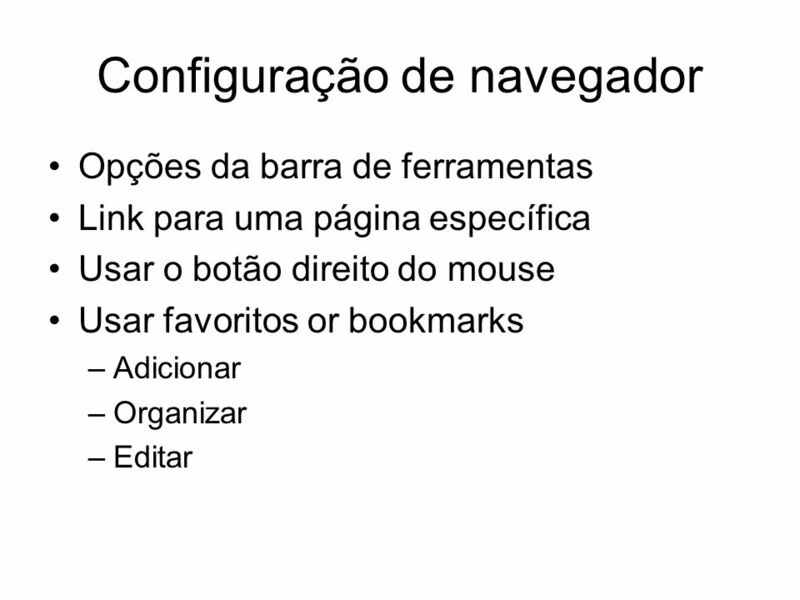 30 Home page button O ícone casa (home) na barra de ferramentas irá levá-lo de volta à página eletrônica pré-determinada no seu navegador. In Internet Explorer, the HOME button takes you back to the browser’s default home page. 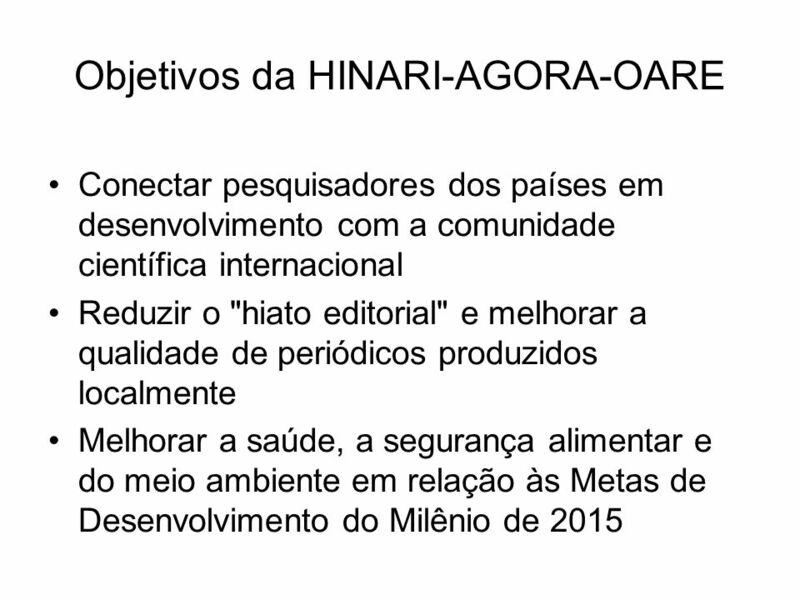 Este é o fim do módulo 1.1 Há um caderno de exercícios práticos sobre os temas abordados neste módulo que acompanha esta parte do treinamento. 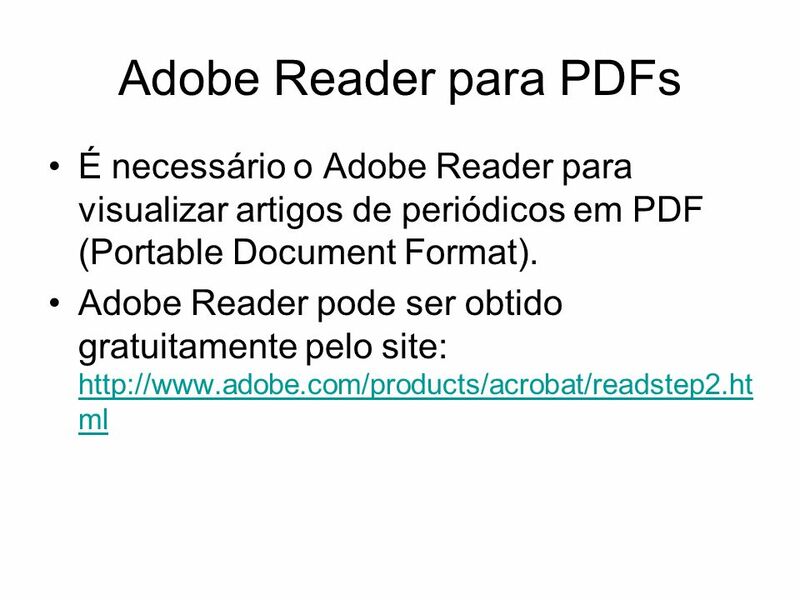 Atualizado This is the end of Module 1 There is a Work Book to accompany this part of the module. The workbook will take you through a live session covering the topics included in this demonstration with working examples. 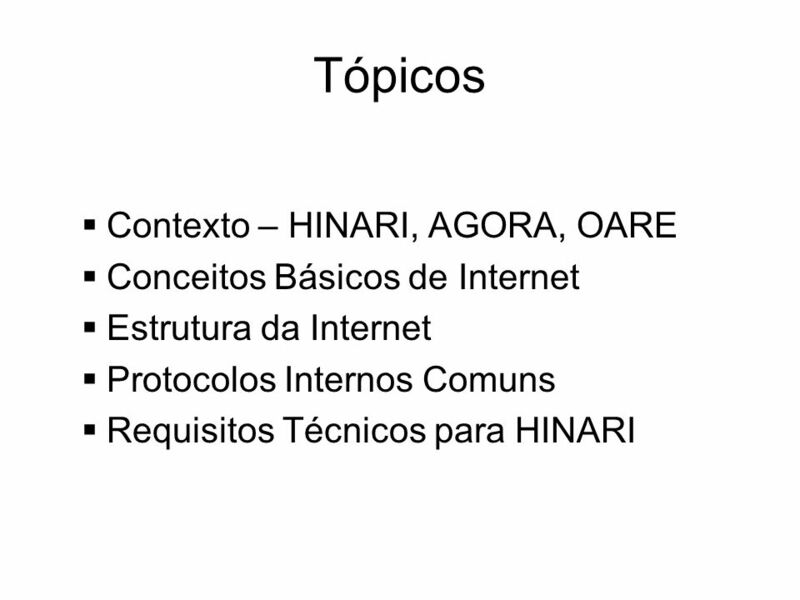 Carregar ppt "HINARI/Conceitos Básicos de Internet (módulo 1.1)"